with 245 homes and lots of different activities for everyone. 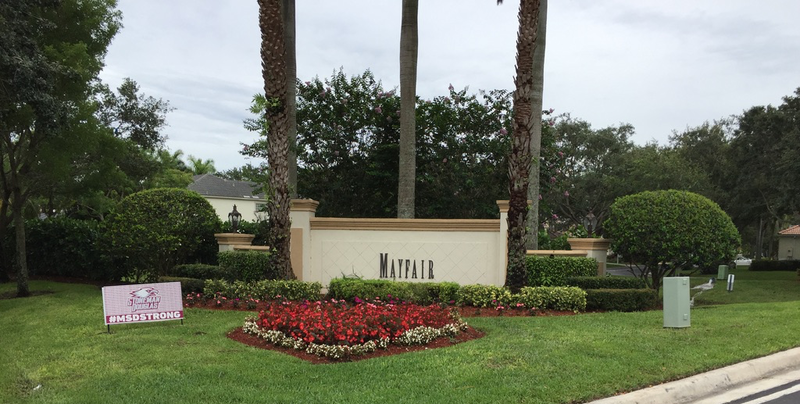 The Florida Department of Transportation (FDOT) is schedule to make a presentation to the Parkland City Commission regarding the requested noise wall from the Mayfair community. The community requested, at the FDOT’s August Public Involvement Meeting, that the FDOT take a look at the area of the improvement project that bordered along the community and any consideration for a noise wall to minimize the impacts from the proposed roadway improvements. That study has been completed and the results will be discussed at the March 6th City Commission workshop. That workshop will begin promptly here at City Hall Commission Chambers at 6pm. Want to help make Mayfair better, volunteer your time and be on a committee? The board of directors needs your help. This is a very important topic to all homeowners, please see our blog on this subject. We ask that everyone try to participate in the discussion. We are going to need EVERYONE's help on this. Help the board of director's out by providing input into how you see the community. Use our suggestion box feature to help the Board of Director's stay on top of things. If you wish to receive correspondence from the Board of Director's, sign up here.